April and Joe Simpkins at Abe's Garden, the Nashville memory-care facility where Joe moved as his Alzheimer's advanced. "My husband's still living, and now I'm in an even more difficult situation — I'm married, but I'm a widow," she says. These women draw the shades and open up to each other in ways they can't with their lifelong friends. "They're still wonderful friends, but they didn't know how to handle this. It was hard for them, and as you all know, your friends don't come around as much as they used to," Bartholomew says. "I was in bad shape. I didn't think I was — I did have health problems, and [now] I know I was depressed." As the numbers of Americans afflicted with Alzheimer's disease continue to swell to an estimated 5.7 million, so do the legions of loved ones caring for friends and family members. The toll on Bartholomew's own mental health is one of the reasons the Alzheimer's Foundation of America focuses on the nation's estimated 16 million unpaid caregivers. With no cure on the horizon, the foundation has been highlighting the necessity of better support for those caregivers through a national tour. It stopped in Nashville earlier this spring, was in Tempe, Ariz., in June and heads to Fairfax, Va., in September; the tour includes at least six more cities in the fall. At the live events, Alzheimer's researchers and clinicians offer guidance on a number of topics, including how to ensure safety for patients at home, care planning and even how to entertain someone with memory loss. The organization promotes in-person and telephone support groups, since being a caregiver is often a barrier to getting out of the house alone. But even virtual support systems have shown some effectiveness at reducing loneliness, stress and depression in a small 2014 study. 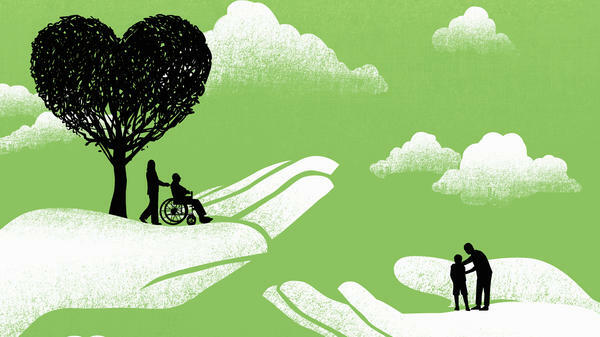 "We have to do everything we can to educate a caregiver, to provide them with the best practices on caring for somebody," says Charles J. Fuschillo Jr., the Alzheimer's Foundation of America's CEO. Feed Alzheimer's patients one food at a time. "A busy plate can be confusing," the group says. Remind a person with Alzheimer's to use the toilet; don't wait for them to ask. Just as important, Fuschillo says, "We want to do everything we can to avoid caregiver burnout." The breaking point sneaks up on even the most committed caregiver, say Alzheimer's advocates, especially as the nights grow more sleepless. Alzheimer's patients can tend to pace, or wake up their partner every few minutes. They can even become violent. Or, perhaps worse, they can leave the house. "And I've had some issues at night that I had to take care of alone," says Pam Hawkins, whose husband has Alzheimer's. "But I'm not ready to have anyone there at night." For now, she says, her husband usually sleeps all night. And if there's a problem, her son-in-law is 15 minutes away. She's had to hire caregivers during the day. Knowing how to find and hire the right person is a shared concern by Alzheimer's family members that has inspired an entire checklist for navigating the process. The tips include these: Interview the aide in the home. Over-share information about the patient. Ask what kind of quality control a supervisor will provide. Hawkins is adamant about keeping her husband at home, whatever the cost. "He's not going anywhere," she says. "He's staying at our home until he moves to heaven. We made that decision a long time ago." But many caregivers have no choice. April Simpkins says tending to her husband became all consuming, and she's young enough that she still needs to keep her job; she works at a local university. "It was not possible for us to keep Joe at home," she says. Simpkins found she'd often have to call her husband's siblings to settle him down over the phone. One night, she had to dial 911 when he kept yelling in the hallways of their condo building. And yet she felt some societal pressure that she wasn't doing enough. "There's a lot of ... glory given to the whole idea of someone being long-suffering and staying at home and giving up their life, basically, to care for their loved one," Simpkins says. "It makes it harder for people who can't do that." Everyone around the table nods in agreement. 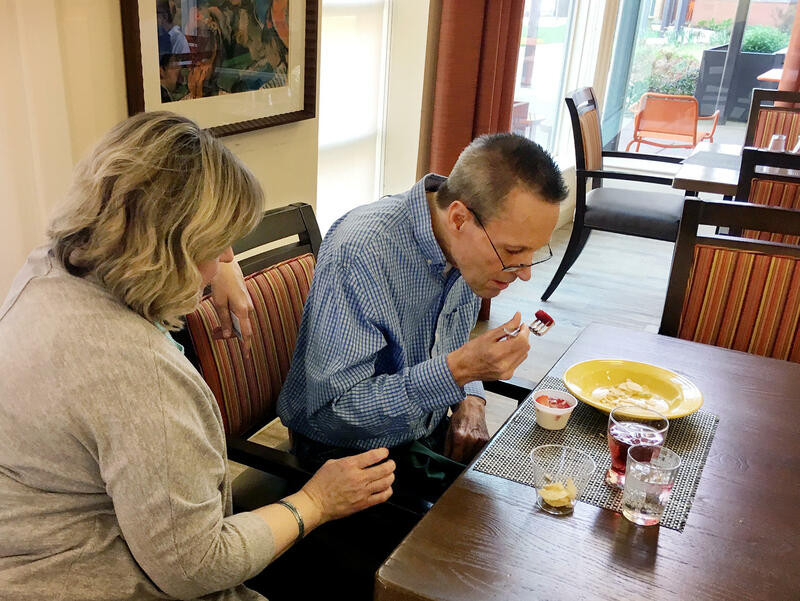 Whatever stage of illness their loved one is experiencing, these caregivers understand the complicated existence that many have dubbed "the long goodbye." Along with sharing the sorrow, they find a way to share in the humor of it all — one woman says her husband wears a laundry-basket's-worth of shirts and pants because he forgets he's already gotten dressed. Even tips on how to reduce the odor from incontinence are offered with a loving laugh. The support group ends with hugs. Some women head for the parking lot. Others buzz through the locked doors to see their husbands. Simpkins sits down for lunch with Joe, who is a former state employee and a youthful-looking 66 years old. She drapes an arm around his slumping shoulders and assists him as he spears a cold strawberry with his fork. "You know, there are some days," she says, interrupted by a random reflection from Joe. "Yeah, some days are clearer than others." Simpkins tries to stop by to see her husband every day. But it's a wicked kind of blessing, she says, that when she misses a visit, Joe no longer notices. This story is part of NPR's reporting partnership with Nashville Public Radio and Kaiser Health News. People who are living with Alzheimer's disease need caregivers. And often, that job falls to a family member or a close friend. It is a difficult role. And now some caregivers are getting some extra support. Blake Farmer reports from member station WPLN in Nashville. BLAKE FARMER, BYLINE: Vicki Bartholomew started this monthly support group because she needed it herself. VICKI BARTHOLOMEW: My husband's still living, and now I'm in an even more difficult situation. I'm married, but I'm a widow. FARMER: They gather in a conference room where her husband now lives, a residential facility called Abe's Garden. They draw the shades and open up in ways they can't with their closest friends. BARTHOLOMEW: They don't understand that I need them. UNIDENTIFIED PERSON #1: We do. UNIDENTIFIED PERSON #2: We do. FARMER: Bartholomew's husband, a prominent local attorney, moved out in 2015. And she's starting to remember him more fondly - when he could care for her. But that's a recent breakthrough. BARTHOLOMEW: I was in bad shape by the time he - I didn't think I was. BARTHOLOMEW: Now, I did have health problems. And I know I was depressed now. FARMER: The toll on Bartholomew is why the Alzheimer's Foundation of America focuses on the estimated 16 million unpaid caregivers in the U.S. CEO Charles Fuschillo says, without an imminent cure, the foundation has been highlighting the necessity of those caregivers and promoting in-person and telephone support groups along with webinars. CHARLES FUSCHILLO: To provide them with the best practices on caring for somebody - but so equally as important, we want to do everything we can to avoid caregiver burnout. FARMER: It sneaks up on even the most committed, especially as the nights grow more sleepless. Alzheimer's patients will pace the house or wake up their partner every few minutes. They could even become violent. PAM HAWKINS: And I've had some issues at night that I had to take care of alone. But I'm not ready to have anyone there at night. FARMER: Pam Hawkins had to hire caregivers during the day. But she's adamant about keeping her husband at home. HAWKINS: He's not going anywhere. He's staying at our home until he moves to heaven. We made that decision a long time ago. FARMER: But many caregivers have no choice. April Simpkins says tending to her husband became all-consuming. And she's young enough that she still needs to work. APRIL SIMPKINS: It was not possible for us to keep Joe at home. FARMER: One night, she had to dial 911 when he kept yelling in the hallways of their condo building. And yet, she felt some societal pressure. A. SIMPKINS: There's a lot of glory given to the whole idea of someone being longsuffering and staying at home and giving up their life, basically, to care for their loved one. And it makes it harder for people who can't do that. FARMER: Everyone around the table nods in agreement. Despite the varied stages, they understand the complicated existence many call the long goodbye. The support group ends with hugs. Some head for the parking lot. Others buzz through the locked doors to see their husbands. April Simpkins sits down for lunch with Joe. A. SIMPKINS: Look at that. Use the fork. Let me get a strawberry for you. Is it good? J. SIMPKINS: A little on the cold side, yeah. FARMER: April drapes an arm on her husband's slumping shoulders. He's just 66 and looks younger. J. SIMPKINS: How many of you think I'm capable of handling myself? Raise your hands. Yeah, some days are clearer than others. FARMER: April tries to stop by every day. But she says it's a wicked kind of blessing that when she misses a visit, he no longer notices. For NPR News, I'm Blake Farmer in Nashville. KING: That story was part of a reporting partnership between Nashville Public Radio, NPR and Kaiser Health News. (SOUNDBITE OF BONOBO AND FINK'S "IF YOU STAYED OVER") Transcript provided by NPR, Copyright NPR.